Do you prefer the sound of Acoustic or Electric guitar? Or do you enjoy both the same amount? Depends what it's being used for. Which in turn depends on the arrangement of the piece. Listen to some of the songs in the MTV Unplugged collection by various artists. To me there are some songs that sound better on acoustic and some that just sounded better plugged in. Electric is great for teaching to play and for kids, too. My son will get his calluses slowly, over time, and then hopefully move up to acoustic. I've written my own music for years and I really like how smooth and easy electrics are to play. I often play my acoustic outside, though. I also use it to put my son to sleep (no, not the bonk-on-the-head way, the whimsical melody way..). I picked both. Here is some inspiration for budding guitarists.. Myself I first leaned on 4 strings with my grandfather's banjo and the same year at school with a ukulele. I didn't move up to 6 string until I was a teenager. I've always been told it's best to learn on acoustic first so you don't learn to be a sloppy player before moving up to electric as an electric is so much more forgiving. I've always been told it's best to learn on acoustic first so you don't learn to be a sloppy player before moving up to electric as an electric is so much more forgiving. I've heard this as well which is why I learned on acoustic before I bought electric. Anyone remember OLGA? The OnLine Guitar Archive where you could download a boatload of tablature. It was shut down because supposedly it's illegal for me to publish how to play a song. Anyways, once I started learning songs through tabs I forgot how to read music. I sucked on the guitar which is why I stopped playing. I still own an acoustic which is in need of repair, a Stratocaster and another Stratocaster autographed by Sigur Ros. First song I learned how to play from start to finish: Hey Joe. I like both. I own both. One of these years I'm going to learn how to play both. Yes I used OLGA all the time. Now go to ultimate guitar. Lots of free tabs there. I am partial to playing acoustic. I love learning ways to play a song on one acoustic and sound accurate and full. And I love the tactile and earthy feel. I learned to play on acoustic.. only when I was older did my mom buy me an electric. it kind of goes both ways to be honest.. on an acoustic you actually can get away with a lot that you can't get away with on an electric.. because the electric amplifies every single little noise or movement you do. The flexibility of the electric guitar is practically endless, depending on the pickups, effects, amps, etc... There is just so much texture to electric guitar. That said, a quality acoustic guitar can be a life changing experience too. Something very basic, rich and emotional. I really love both. Even though I voted Electric, I have say both electric and acoustic guitar.. I have several of each. I started on electric and that's what I enjoy playing (and listening to) the majority of the time, with the exception of some acoustic stuff here and there.. depends on what mood I'm in. Have to also agree that acoustic is the best to start with. It will build up your fingers and will make you a cleaner, more precise player in the long run.. that translates over to being able to play electric better. Edited by SiLic0ne t0aD85, Wed Apr 22, 2015 8:04 PM. 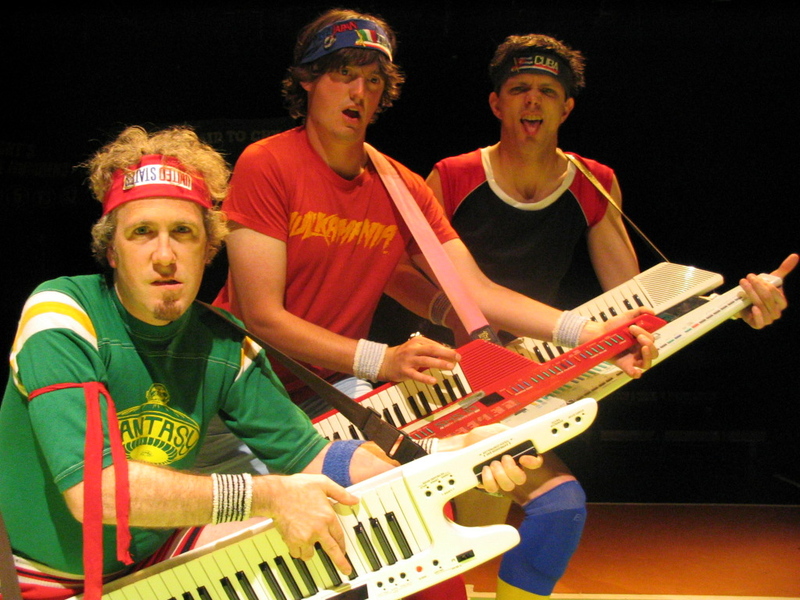 There are few things cooler...than the keytar! Don't be knocking the keys, man. Truth be told, that's my axe of choice! Good work, Vince. What do you record with? I voted acoustic because you just pick it up and play it. No fancy sound equipment needed. I can't imagine someone bringing an electric guitar and a portable amp to sing around a campfire. That just doesn't feel right. I have an acoustic that I tried to self teach myself years ago. I learned a bunch of chords but I never got that sense of rhythm down. I can also pick out simple melodies by ear alone. I haven't played in a while though and my calluses disappeared. I picked it up about a month ago with those medium gauge strings and it gave my fingers agony. I really need to take actual lessons but haven't the time to do it. Both. Like a tool either are used for specific applications. Both. Acoustic is the best way to get you started and to teach you the fundamentals. Electric when you are in your garage/basement jamming with your buds. I've written a TON of music over the years.. It used to have a bunch of likes and listens but then it all disappeared one day so I just put it back up today..
And, I'm not entirely sure just anyone can listen to it..so here's a couple of files. The best of it, prolly..
Edited by Papa, Sat Apr 25, 2015 9:16 AM. ..and here's a really big demo.. Thanks. Presonus firepod, SM57, SM58 and a couple cheap condensers into Logic 9. Drums are all EZ Drummer. Bass is all Logic's bass amp plugins. These days I've been using an 11 Rack and S-Gear plugin for guitars, purely for convenience, although I do mic my amp if I get a rare weekend with the wife & kid away. Link Wray's "Rumble" doesn't sound right on an acoustic guitar.